Most endocrine hormones are controlled by a physiologic negative feedback inhibition loop, such as the glucocorticoids secreted by the adrenal cortex. The hypothalamus secretes corticotropin-releasing hormone (CRH), which directs the anterior pituitary gland to secrete adrenocorticotropic hormone (ACTH). 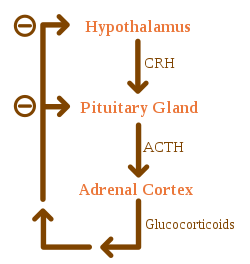 In turn, ACTH directs the adrenal cortex to secrete glucocorticoids, such as cortisol. Glucocorticoids not only perform their respective functions throughout the body but also negatively affect the release of further stimulating secretions of both the hypothalamus and the pituitary gland, effectively reducing the output of glucocorticoids once a sufficient amount has been released. หน้านี้แก้ไขล่าสุดเมื่อวันที่ 28 ธันวาคม 2561 เวลา 18:59 น.